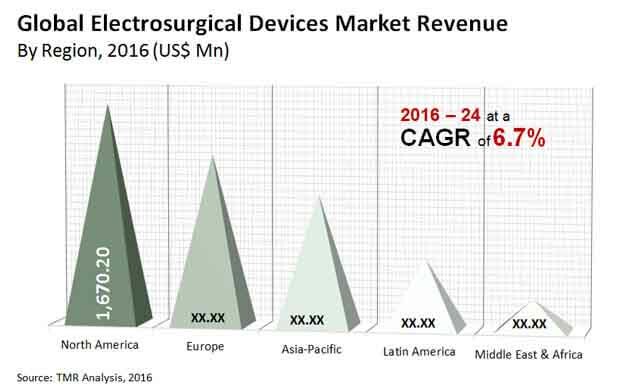 The global market for electrosurgical devices appears to be highly fragmented due to the presence of a large number of players. However, the level of competition among the market players is moderate, says Transparency Market Research (TMR). Some of the leading companies operating in the global market for electrosurgical devices are Boston Scientific Corporation, Johnson & Johnson, CONMED, and Bovie Medical Corporation. A number of market players are striving to boost their profits by adopting business strategies such as investment in research and development in order to launch more innovative products with cutting-edge technologies. For instance, ERBE Elektromedizin GmbH announced the launch of its new APCapplicator electrosurgical handpiece in 2016. This device can be used for coagulation purposes as well as vessel cutting in laparoscopy and open surgery. PlazXact™, another new product for the cutting, coagulation, and vaporization of soft tissue, was introduced by Bovie Medical. It received approval of the U.S. FDA for the same in August 2016. In 2015, the global market for electrosurgical devices was pegged at US$4,480.8 mn. Expanding at a favorable CAGR of 6.7% between 2016 and 2024, the market will attain a revenue worth US$7,963.2 mn by the end of 2024. The electrosurgical accessories segment held a whopping 53% share in the global electrosurgical devices market in 2015. Based on geography, the global market for electrosurgical devices has been segmented into Europe, the Middle East and Africa (MEA), North America, Asia Pacific, and Latin America. Currently, North America has risen to prominence in the global market, driven by factors such as availability of innovative products, increasing number of surgical procedures, and the presence of leading market players in this region. The rapidly growing geriatric and obese population in countries such as the U.S. has been a major growth driver of this market. Asia Pacific is also slated for considerable growth over the forthcoming period, as the demand for electrosurgical devices is triggered by the substantial expansion of healthcare infrastructure and growing healthcare expenditures. Asia Pacific appears to be holding maximum potential for expansion, developing at a CAGR of 7.7% during the forecast period. Numerous government reimbursement policies, along with coverage of medical bills by insurance policies, have been instrumental in boosting the demand for electrosurgical devices across the globe. The increasing adoption of electrosurgical devices by major end users such as specialized clinics, hospitals, and surgical ambulatory units has been garnering more demand, thereby contributing towards expansion of the global market. Governments of various nations are increasing their investments allotted for R&D projects for the development of advanced medical treatments and highly efficient devices. On the other hand, the risk of electro-thermal injuries, coupled with post-operative complications arising because of failure of insulation, direct coupling, improper application of electrosurgical devices, and capacitive coupling, might restrain the growth of the global market for electrosurgical devices. However, significant opportunities will be provided by the introduction of innovative multimodality systems including robotic surgical systems, which will prove to be more precise and convenient over the next few years. The information presented in this review is based on a Transparency Market Research report, titled, “Electrosurgical Devices Market (Product Type - Radiofrequency Electrosurgery Devices (Monopolar and Bipolar), Electrocautery Devices (Monopolar and Bipolar), and Electrosurgical Accessories; Application - General Surgery, Gynecology, Cardiology, Urology, Dermatology and Cosmetology, Orthopedics, Neurology, Oncology, Dentistry, and Gastrointestinal Surgery; End User - Hospitals, Ambulatory Surgery Centers, and Specialized Clinics) - Global Industry Analysis, Size, Share, Growth, Trends, and Forecast 2016 - 2024”.